By most measures, metro areas such as Austin, Texas; Nashville, Tenn.; and Raleigh, N.C.; have enjoyed some of the strongest economic growth in recent years. The resulting prosperity, however, isn't spreading across all segments of the workforce, particularly to the lower rungs of the economic ladder. These three regions and others have enjoyed strong job gains but earned low marks on measures of economic inclusion in a Brookings Institution report released Thursday. The study, while assessing overall growth and prosperity, also examines the extent to which standards of living have improved for all people within metro areas. Brookings ranked the 100 largest metro areas using a series of indicators in four areas: economic growth, prosperity, economic inclusion and inclusion by race. Most metro areas registered gains in economic growth and prosperity, but few improved on measures of inclusion, which considered median wages, employment-to-population ratios and relative income poverty rates (the share of the population earning less than half the local median wage). Between 2009 and 2014, only eight metro areas improved on all three inclusion indicators: Charleston, S.C.; Chicago; Dayton, Ohio; Denver; Provo and Salt Lake City, Utah; San Jose, Calif.; and Tulsa, Okla. Consider the Austin metro area: It recorded the strongest growth nationally in both total jobs and gross metropolitan product. 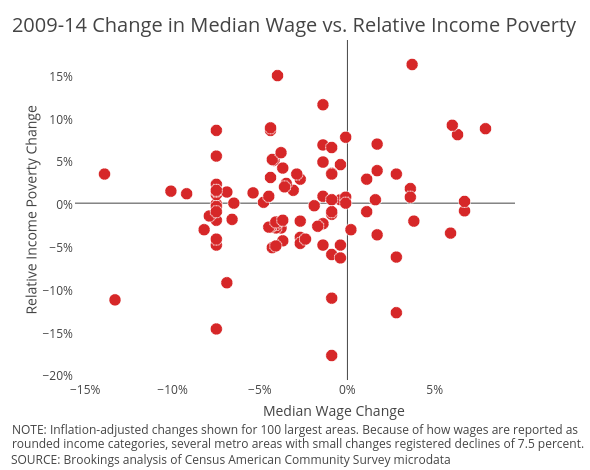 At the same time, its inflation-adjusted median wage still declined and the relative income poverty rate climbed faster than in all but 18 other areas. As one would expect, increases in productivity coincided with climbing average annual wages across metro areas. Interestingly, however, the report found no relationship between changes in median wages and relative income poverty -- two indicators of inclusion. Of the 20 metro areas recording median wage increases from 2009 to 2014, just eight of them experienced drops in relative income poverty rates. Shearer said this finding suggests middle-class economic gains don’t necessarily translate to better outcomes for those in the bottom tier of the income distribution. Areas with the largest declines in economic inclusion are mostly concentrated in the Sun Belt. Some of these economies are largely comprised of low-wage jobs in the retail, hospitality and food service sectors. Others were hit hard by the bursting of the housing bubble and still haven’t fully recovered. “These places are struggling to move their economies away from housing and construction to more durable sources of growth,” said Shearer. It’s important to note that the study compared metro areas’ rates of change for each indicator, not their ending levels. High rankings for inclusiveness also don’t necessarily mean that such areas are more inclusive, as some incurred greater losses during the recession or started to decline long before 2009. Disparities across racial and ethnic groups also worsened throughout much of the country’s larger urban regions. In the majority of metro areas reviewed, gaps in median wages and relative income poverty for whites and minorities widened. Improvements in overall economic inclusion didn’t translate to gains for racial and ethnic minorities, either. In fact, many areas posting the best outcomes for overall inclusion recorded some of the largest declines in racial and ethnic inclusion. This often played out in the Great Lakes region in places like Cleveland, where real median wages for whites increased but declined 7 percent for other racial groups. Meanwhile, disparities often narrowed in areas where overall inclusion indicators plummeted. This was the case in Las Vegas and parts of the Southeast. Shrinking gaps on measures of economic inclusion typically didn’t point to any gains for minorities, but rather deteriorating outcomes for whites, said Shearer. Nearly all metropolitan economies grew between 2009 and 2014. Gains in prosperity, though, were somewhat harder to come by. Just 63 of the 100 metro areas reviewed experienced increases in average annual wages, productivity and the standard of living. Areas benefiting from strong tech or professional services sectors performed particularly well, according to the report. Improvements in all facets of the economy remained elusive. Only two metro areas, San Jose and Houston, recorded above-average improvements in all areas reviewed (including inclusion by race) over the short-, medium- and long-term. Individual industries fueling regional economies largely dictate how they perform, as shown by the rapid growth of several energy and tech-supported regions. Demographics, too, play a major role in overall outcomes. Another factor, of course, are policies that either promote or hinder economic inclusion -- an area policymakers can't ignore if they want to improve prospects for all workers.